Tart Cherry Smoothie Bowls are extra thick smoothies full of filling protein, healthy fats and a balance of sweet and tart fruits, and topped with plenty of crunch for a complete meal. Thank you Milk Means More – United Dairy Industry of Michigan for sponsoring this post. All opinions are my own. Parenthood: skirting the truth with kids for their own good since forever. I make no apologies. A smoothie bowl is even better because not only are the good-for-you-stuffs covertly camouflaged, but the spoonably thick concoction is topped with a variety of enticing nibbles that make the whole affair akin to a trip to a fro-yo sundae bar. The secret ingredient in this particular smoothie? Avocado! For as much as my boys happily hoovered chunks of avocado into their mouths by the fist-full as toddlers, not one of them will knowingly ingest an avocado now. Weirdos. Tart Cherry Smoothie Bowls are extra thick smoothies full of filling milk protein, probiotics, healthy fats. A balance of sweet and tart fruits, and plenty of crunch on top for a complete meal. Tart Cherry Smoothie Bowls are loaded with balanced nutrition to keep hunger at bay. One of these smoothie bowls in the morning will easily sustain me until lunch time. The sweet and salty blend of flavors helps me skip right through the usual 11:00-ish pre-lunch cravings. Those suckers send my good eating intentions into a downward-spiral-of-regret as I tear apart the pantry in search of a errant Hershey bar or Frito. Instead of regret, we can load up on a Tart Cherry Smoothie Bowls and everyone is full and satisfied all morning long. 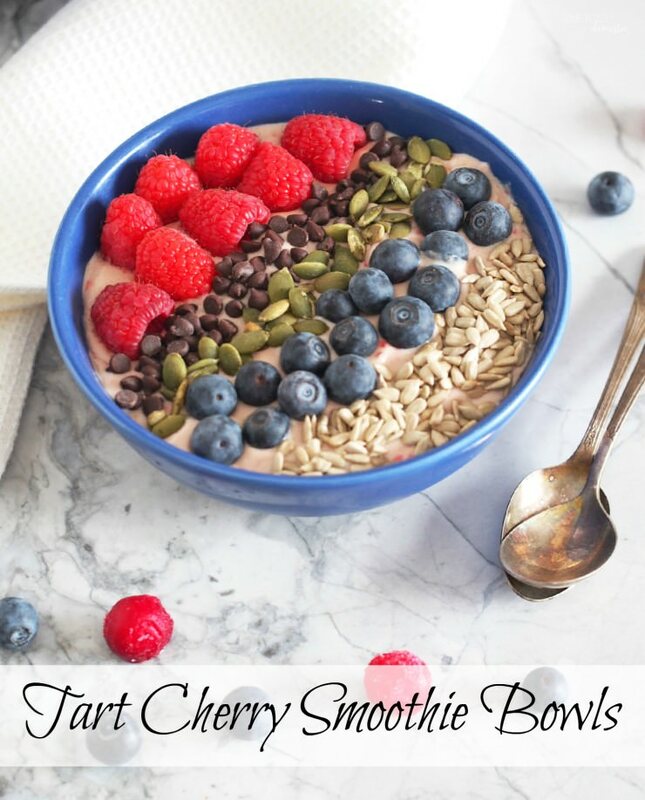 Try these delicious Tart Cherry Smoothie Bowls! Tart Cherry Smoothie Bowls are extra thick smoothies full of filling protein, healthy fats and a balance of sweet and tart fruits, and topped with plenty of crunch for a complete meal. Pour the milk into a large blender carafe. Add the yogurt, frozen tart cherries, banana, and avocado to the carafe. Firmly secure the lid and puree until smooth. The smoothie will be very thick, so in the absence of a heavy duty blender, pulse the blender speed between medium and high powers as required. Once the smoothie is thick and smooth, divide it equally between four serving bowls. Top each smoothie bowl with 1 Tbs. of sunflower seed kernels, 1 Tbs. pumpkin seed kernels, 1 Tbs. miniature chocolate chips, 1/4 C. red raspberries, and 1/4 C. blueberries. Smoothie bowls are wonderful! I bet the tart cherries add a great zing to the mornings! I can't wait for tart cherries to be in season now. mmmm what a great way for anyone to start the day! So many delicious things happening here! I want to dug in! You know, I've never made a smoothie bowl. My daughter just asked me the other day if I would so I'm bookmarking your recipe to make very soon. It looks and sounds so good. This is so awesome. I never thought to try tart cherries. I've done other kinds of cherries but never tart. Now I need to. Because I'm a cherry fanatic and need to try ALL the cherry recipes. I love that you can hide good stuff in delicious food and kids are cool with it. Recipes like this feel like a parenting win, you get them to eat well, you trick 'em a little bit and you feel like wonder woman. All things that make me smile. Beautiful smoothie bowl. I haven't tried one yet, but this makes me want to. Tart cherries are SO delicious! 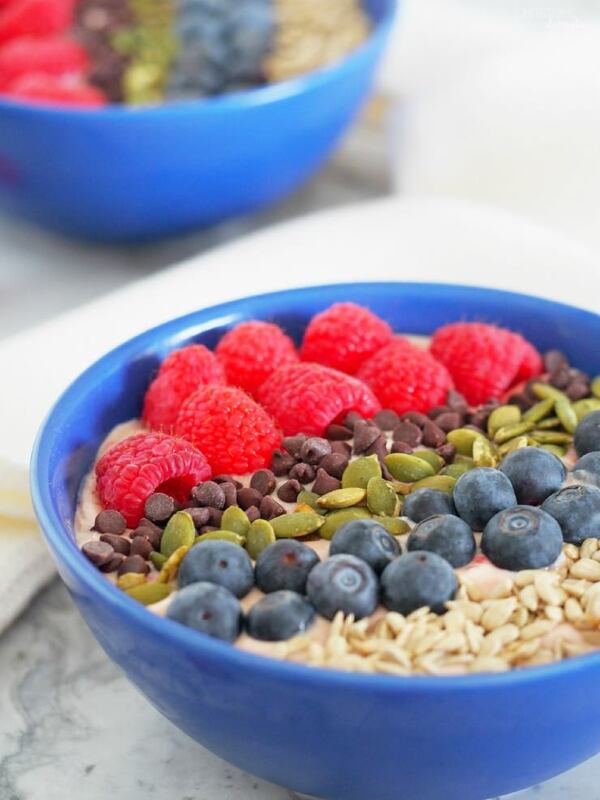 What a fabulous idea to make a smoothie bowl with them. 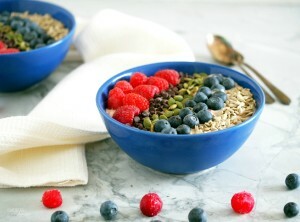 I love the bright colors - wish I could have this for breakfast in the morning!! Smoothie bowls sure a popular these days. I like your selection of toppings. I'd eat that! I'd be totally for this just because there are blueberries in it hahah, ok well not JUST because but I do love them. 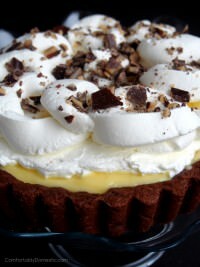 Maybe I'll make these for brunch this weekend! Tart cherries are one of my favorite things in the world! You live in the perfect place to get your hands on the best ones, too (so jealous). These are beautiful bowls and sound incredibly delicious, too. Like all your crunchy toppings...gives the mouth something to do, too! This looks amazing! Smoothie bowls are my new obsession and I am totally trying this cherry one next week! Love it! So much goodness packed into one bowl!! And gorgeous too! Beautiful! 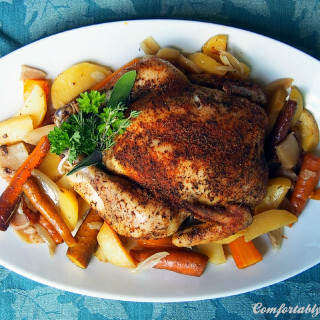 This looks so flavorful and refreshing, I'd love a bowl of it right now for dinner! Gorgeous! Smoothie bowls are my favorite right now because I can mix up my toppings! This looks like the perfect way to start the day! I love all those healthy ingredients and the toppings are so fun! I have yet to try a smoothie bowl, but I love the idea of toppings! !